It may be safe to say that 2016's Nexus phones are the most anticipated devices in the brand's history. And we've been rather prolific in our coverage of what, frankly, would qualify as minutiae here at Android Police were it in regard to any non-Google device. And we get that. We initially showed you renders of Sailfish and Marlin (and yes, they still look the same - just different sizes) back in July. We also shared specifications for both Sailfish and Marlin in June, respectively, here and here. Before I discuss the images you have already seen above, let's talk about what we know and continue to believe. Marlin and Sailfish share the same basic industrial design and materials. There is no "plastic" phone between the two. We still believe both devices are built by HTC and will have identical specifications aside from screen size, resolution, and battery capacity. In short: anything you're hearing at this point about a "budget" Nexus, a Nexus made predominantly of plastic, or two different Nexus "designs" is news to us. And we would be exceptionally skeptical of anyone claiming this. We're not saying it's impossible, but we've seen literally nothing to suggest anything like this (either in visual evidence or from our trusted sources). So, to recap: two Nexus phones, both built by HTC, basically identical specs at different sizes (5.0" and 5.5"), and with basically identical design and materials. Now, on to the fun part: what are you seeing above? That would be Sailfish (we are 100% positive this is Sailfish), the smaller 5.0" Nexus device. You'll notice that it is indeed quite metallic. We also feel at this point that the darker, glossy pane around the fingerprint scanner and camera module is glass, not plastic. Compared to our renders of a month ago, this seems like a strong match. 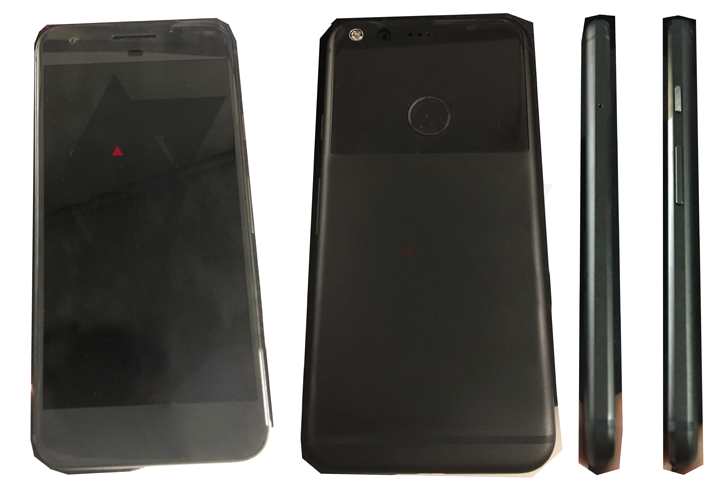 You'll notice that the Google "G" logo is absent in these photos, but we believe that by the time handsets enter production, the "G" will be present (i.e., no "Nexus" logo). It also looks very much like the grainy image leaked by an anonymous Twitter user yesterday that a great many of you have sent to us as a tip. The leaker's wording here is a bit prone to misinterpretation regarding the glass back, and I hope our images clear up any uncertainty there about the extent to which it... extends. I also hope our profile shots make it clear that this phone is not abnormally thick. It's not crazily thin, but the angle in the shot above definitely exaggerates Sailfish's girth. That leaker also posted a text-only tweet claiming that one device he saw was "premium" and another "glossy plastic," with both being smaller devices ("<5.5 inch screen"). I think the most likely interpretation here is that the "glossy plastic" phone wasn't a Nexus at all, but another non-Nexus smartphone that this person simply didn't recognize. I can't really speculate beyond that - we have no visuals, no extended description, so at this point, I'm chalking the leaker's assertions here up to error. So, there you have it: live photos of a 2016 Nexus phone. I'm still holding out for that Electric Blue version. Another photo posted by the same @usbfl Twitter account shows that the speculations about the phone's back being fully glass are misguided by the leakster's first photo's angle and vague wording. The photo clearly shows two different materials, one matte and one with a certain shine, which aligns with what we've disclosed since the start: the two Nexus phones will likely have a metallic finish with a glass covering on half of the back.